For the first time ever, a Power and Control Innovation for your Break Shot, by The Drill Instructor. 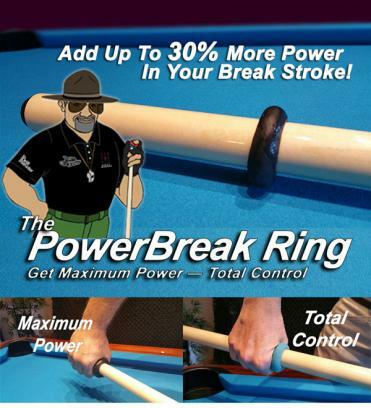 - The POWERBREAK Ring will enhanced the quality of your break shot — I guarantee it! - The POWERBREAK Ring ensures a non-slip full force power stroke break shot every time — especially for those who have struggled with a weak break or a limiting physical condition. - The POWERBREAK Ring guarantees to increase your breaking speed and enhance your breaking power to generate bigger ball spreads — and that could mean pocketing more balls on the break. - The POWERBREAK Ring allows you to snuggle up your back hand into the adjustable grip-enhancing rubber ring — causing you to apply greater G-Force Inertia into every break stroke. will add to the power, force, and control of your break shot. 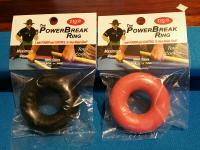 Buy The POWERBREAK Ring and get The POWERBREAK Grip at an additional 40% off our everyday low price.